All essential oils can potentially kill cats if they are used full strength or if the cat swallows it. Essential oils can be found in cleaners or potpourri as well as in aromatherapy oils. Cats have a far different metabolism than people. Their livers cannot quickly eliminate toxins from essential oils. This causes a buildup of toxins that could kill the cat. Essential oils contain a potentially toxic particular type of hydrocarbon called terpenene. People’s bodies contain an enzyme in order to quickly move terpenenes out of the body through urine and feces within 48 hours. The enzyme helps chemically bind terpentine to the liver’s glucoronic acid. This entire elimination process is called hepactic glucuronidation. 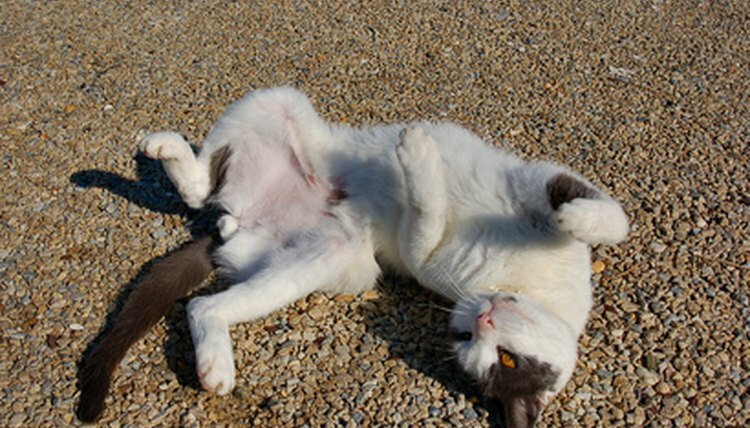 Cats lack these enzymes, and terpenes stay within their bodies or move out very slowly. Some mosquito repellent products for pets may contain concentrated essential oils of tea tree, pennyroyal and orange oil or limonene. These products are far too strong to be used on cats and may cause essential oil poisoning, according to Partners for Animal Welfare or PAW. Symptoms of this poisoning include vomiting, loss of coordination, seizures and liver malfunction. Never use human mosquito repellent on cats because it may contain essential oils. Many flea and tick repelling essential oil blends are sold through alternative healing stores or websites. These often contain the most toxic essential oils to pets: cinnamon, pennyroyal, hyssop, thyme, eucalyptus, tea tree, wormwood, camphor, sage, rosemary and tansy. The instructions may state to apply full strength to the cat’s coat or to dose like a liquid medication. Both of these practices can kill a cat, according to Colorado State University. Heavy diluted pennyroyal or eucalyptus essential oil can be added to cat shampoo to get rid of fleas, according to “The Doctor’s Book of Home Remedies for Dogs and Cats.” Only one or two drops of eucalyptus oil are to be added to the cat’s shampoo. The cat needs to be rinsed off thoroughly so that no shampoo or oil is left on the body that could be swallowed when the cat grooms itself. Never just place pennyroyal essential oil directly onto a cat’s fur.